Apple is working to release a fresh batch of Mac hardware including a standalone 5K display made in partnership with LG, MacBook Air and iMac refreshes, and new iPad Pro software catering to professional users, according to a report on Monday. Citing sources familiar with Apple's plans, Bloomberg reports the company is looking to get back into the monitor game with a high-resolution 5K display made in partnership with existing supplier LG. Apple discontinued the 27-inch Thunderbolt Display, its lone first-party display product, in June. Today's report claims Apple is working to release AMD graphics options for iMac and updated MacBook Air hardware with multi-function USB-C port, presumably in the same vein as current MacBooks which use the port to recharge. The proposition of new MacBook Airs runs counter to predictions from noted analyst Ming-Chi Kuo, who in May said Apple is unlikely to sink further resources into the thin-and-light as it builds out the new MacBook series. 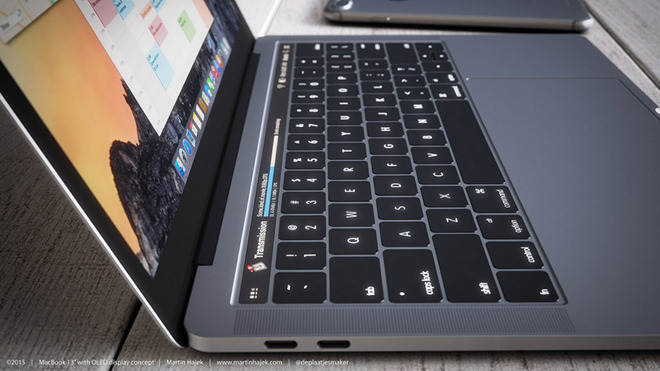 Bloomberg reaffirmed Kuo's predictions of a massive MacBook Pro overhaul expected to arrive later this year with an OLED touch bar, USB-C, Thunderbolt 3 and more stuffed into a slimmed-down aluminum chassis. According to the report, the OLED touchbar, referred to internally as the "Dynamic Function Row," will display both a virtual row of function keys and app-specific commands. For example, the touchbar will display granular controls for editing clips in iMovie and special search tools in Safari. Controls for certain key Mac system functions are to be made available at all times, like volume adjustment assets and a switch to toggle back to the macOS function bar, the report said. On the iPad Pro front, Apple is supposedly developing software to further take advantage of Apple Pencil's unique user input capabilities. Specifically, Apple is working to integrate annotation features across the iOS operating environment, including apps like Mail, Safari and iMessage. An exact launch timeline was not cited, but today's report said Apple could debut certain Mac hardware upgrades as early as October. The iPad and Apple Pencil software enhancements are not expected to see release until next year, either in an update to iOS 10 or as part of the next major iteration of Apple's mobile operating system.